Ned Stern has been painting, professionally, since he graduated from college. He received his degree in Fine Art from The American University in Washington, D.C. He has taught drawing at the Universities of Michigan and Cincinnati. In addition, he has worked in a creative capacity with The Smithsonian Institution, International Telephone and Telegraph Corporation, the U.S. Navy and the Amberley Greeting Card Company among others. His work is in private, museum and corporate collections from Cincinnati to Shanghai. 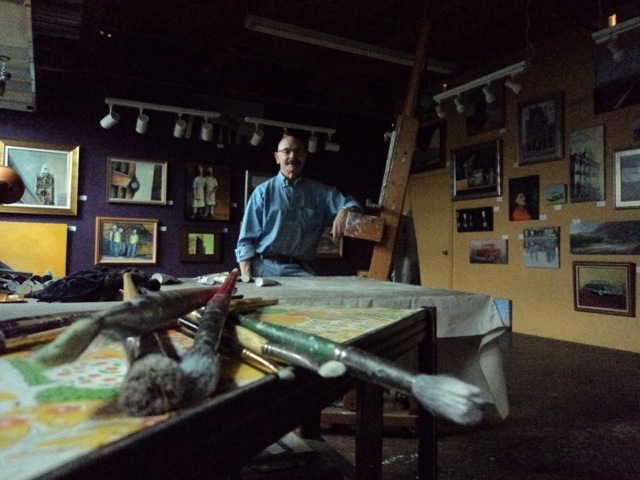 Locally, his work has been shown in the Miller Gallery, Closson's Gallery, the University of Cincinnati, KZF Gallery, Glendale Gallery, The Art Academy, Cincinnati Art Club, Gallery 22, Kennedy Heights Art Center, Art on the Levee Gallery, Tall Stacks, Cincinnati Garden Club, The Verdin Company, Fusion Gallery, Greenwich House Gallery and The Cincinnati Enquirer to name a few. ​Presently, Stern maintains a studio at The Pendleton Art Center, in Cincinnati, where he can be found working daily. Copyright © 2019 Ned Stern. All rights reserved. Web Design by Jenny Perusek.